“There are no reasons behind doing this, its just the passion to do something creative, to do something which only a handful number of people can do, to let the people know that there is more to life than just being and reacting as a normal being. Custom bike is one aspect, not a whole lot of people are aware about this sector, not at least in my city. People barely know that there are more possibilities to it rather than just changing the handle bar of the bike or the rear Tyre. “Amber” our build is one major part of this story. One fine morning a random Royal Enfield rider on the road asked me to come a halt and took a glance at my self-customized Bajaj Avenger. 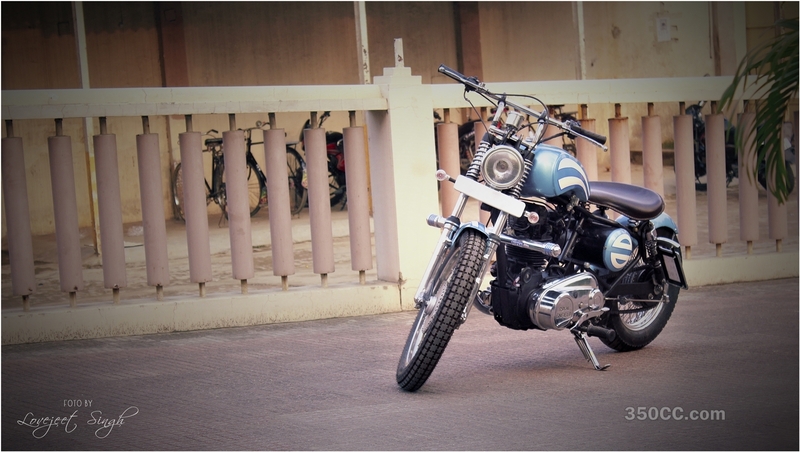 He asked whether I could do something with his Enfield, and therefore I got my first order. What we have done is totally according customer’s specifications. He wanted a light bike which was flick-able in our crowded city, a bike which could easily run, handle well and looked absolutely clean along with fine quality of paint job to match the theme of the bike. The bike was completely loosened because each and every part from the base bike was drenched in rust, and the frame too had some problems. We re-worked on the frame, tweaked the engine a little, painted the frame. plated in chrome, and then treated with rust proof lacquer coating. The round tool box in the middle, hosts every wiring aspect of the bike, the battery, and air-filter to further enhance the clean look the bike. It took me a month to build the bike, when I could afford only one hour a day for this bike, considering I am a exporter, it becomes difficult to spare any time for extra activities. But, as of now, we have a few more orders in our hand, a dedicated team is working on salary basis to complete the work. 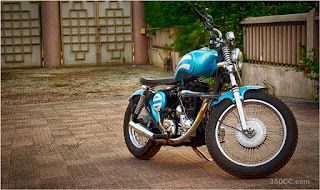 This is how “Cult Classic Motorcycles“, was formed and we have named our first bike “Amber” which is a 350 cc Royal Enfield. 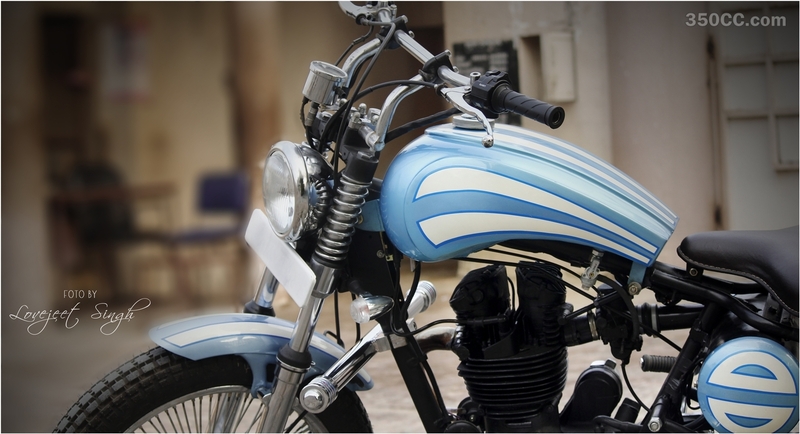 Cult Classic Motorcycles is located in Moradabad, Uttar Pradesh. We started this small venture due to our interest in Motorcycles, and always fantasized of making a motorcycle that would be only one in the city, no one else would be riding the one I do. It was after our first order, I thought of going deeper into the field. I currently own a business of handicraft exports and it was thus easier for me to get started into this new field. 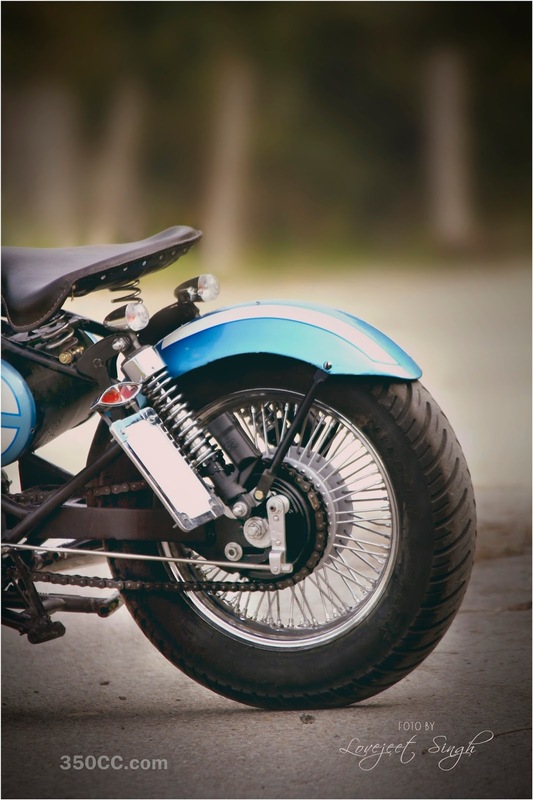 I have my own plating plant, lacquer and powder coating plant and so do I have every kind of machinery in house that will be needed to make parts for the motorcycles. As of now we have few more orders in our hand, we have a full time mechanic also working with us under salary basis. Secondly we offer very reasonable pricing for every kind of built because our labor charger are very minimal, every part is built in-house, thus it reduces various costing factors. 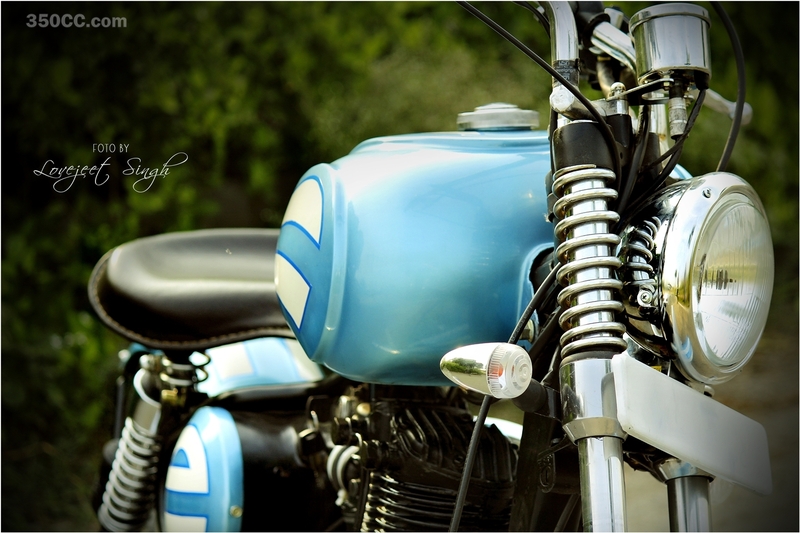 We are open to working on Bobbers, Choppers, Cafe racers, Scramblers or any other type specified by the client. The added advantage is that the client does not always need to necessarily send a donor bike to us, we can also arrange one if required. Lastly, the reason behind naming our venture Cult Classic Motorcycles was because custom bikes have their own trend and cult following, the generation today is heading back towards the likeness of old school builds, they want a very classic feel to their motorcycles and want something very unique and we here make sure that we deliver them uniqueness.